For kids who dislike the texture of avocados, these avocado banana muffins are a great way to get the nutrient rich food in their diet. 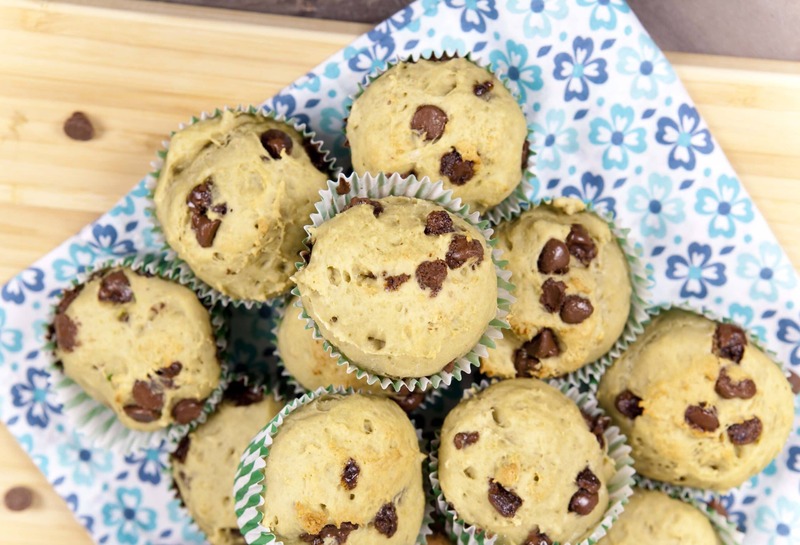 Yes, we did add avocados to these muffins! What a terrific super food to include in your family’s diet. A friend of mine who tried this was excited about the avocado because she has been wanting to eat them, knowing how good they were for you, but she couldn’t handle the texture of avocados! So, these muffins were the perfect answer for her! A while back we posted, 20 Avocado recipes for kids, which has been very popular because so many of you are looking for ways to include avocados because you know the health benefits of them. healthy fats that are important for cell walls and brain development. vitamin C & E which promotes healing and boosts the immune system. fiber, particularly soluble fiber, helping kids with digestion. potassium (which is also included in the bananas of course, making these muffins great for growth and building muscle. phytonutrients that protect against cancer and cell damage. The first and most important thing is to find a ripe avocado! Bananas that are overripe are perfect for baked breads and muffins, but avocados can be too. You want to blend the avocado and banana together until it’s smooth, so the softer they are the easier it will be. You give it a soft squeeze, and it feels firm, yet gives a little to the pressure. If the skin feels dry and brittle, it’s over ripe. If the flesh inside is brown, it’s overripe. 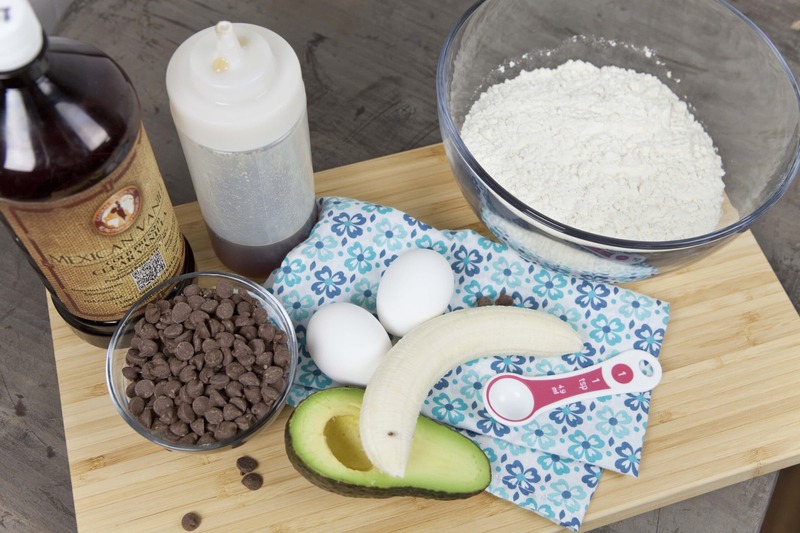 So, with a ripe avocado, and even an overripe banana, you are ready to make muffins! If you make half a recipe, or have a reason to save half of an avocado, you can do that! Top layer of fresh may oxidize a bit and turn grey or brown, but it’s easy to just skim the top layer of flesh off, and the avocado underneath for at least a day or two should still be a bright greenish yellow. Peel the banana and put in a blender or food processor. Cut the avocado lengthwise, and take the pit out. Then, I like to scoop the flesh of the avocado out with a spoon, and add it to the food processor. It’s ideal in the food processor unless you have a small jar for your blender, because there isn’t much liquid yet. Once smooth, then add your eggs, honey and vanilla and mix again. With the wet ingredients, gently fold into your dry ingredients and stir with a wooden spoon, just until moistened. Fold in your chocolate chips! What kind of muffin papers are the best? 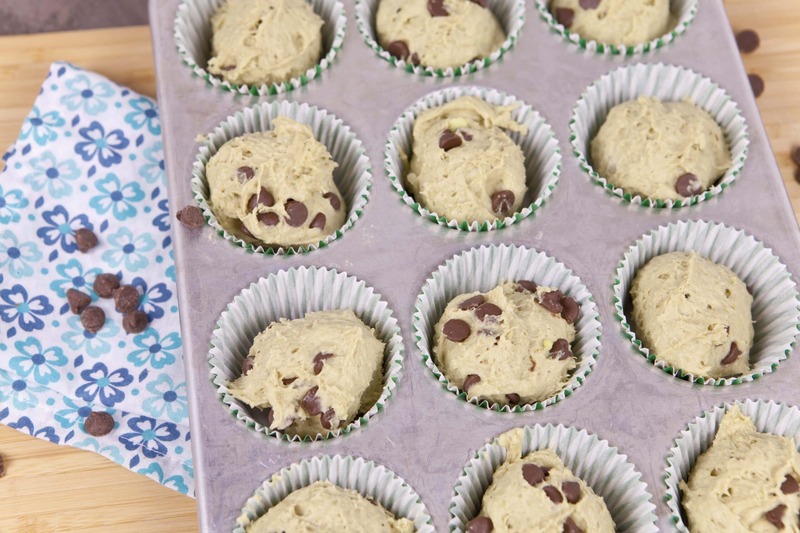 Although muffin papers are great, easy to use, and helps avoid washing, I prefer silicone muffin cups! Healthier muffins tend to stick to the paper so much that you lose half your muffin peeling off the paper. But with the silicone muffin cups, you can pop the whole muffin out of it’s wrapper. They aren’t too difficult to wash. I just flip them inside out, give them a quick scrub and leave them on a towel upside down and inside out to dry. I also like to use an ice cream scoop with a spring loaded handle to scoop out the exact same amount of batter for each cup. 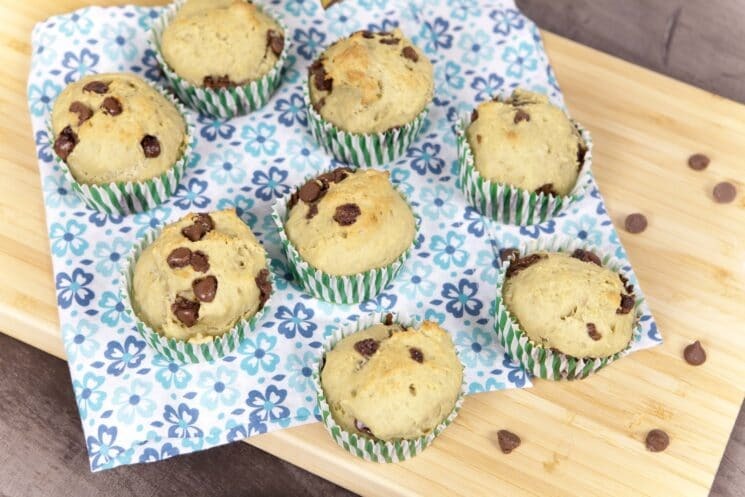 If you are in a hurry, you could also make these mini muffins, and they will bake quicker. 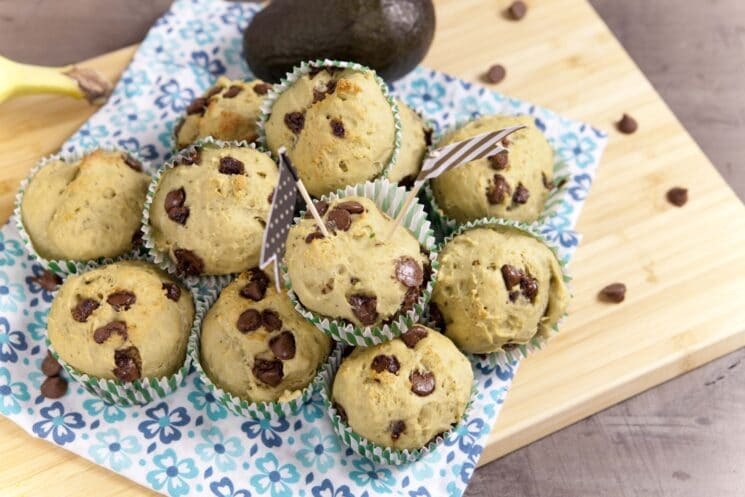 So, let us know how your kids like these muffins, and you can feel good that they are getting some delicious and nutrient rich avocados! Preheat oven to 350 degrees. Place cupcake liners into a muffin pan. Peel the avocado and bananas and add to a food processor or blender. Blend until smooth. Add eggs, honey and vanilla; mix again. 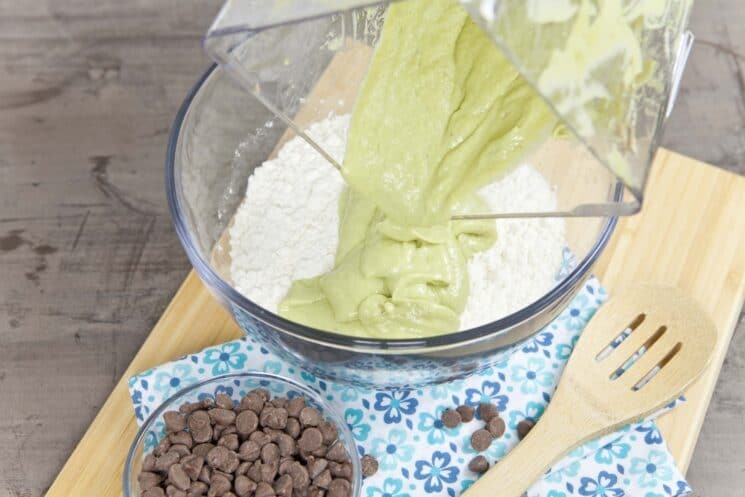 Spoon flour and baking powder into a mixing bowl and whisk together. Add banana mixture and stir gently until combined. 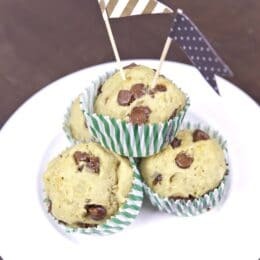 Add chocolate chips; scoop into cupcake liners. Bake for 20 minutes or until a toothpick inserted comes out clean. This is the first baking recipe I’ve seen that from seen that doesnt have salt, is there a reason for that? Can you substitute the whole wheat flour 1:1 with oat flour and the honey with maple syrup? Just tried these and they are so good! Was unsure what to expect, as I’d never tried a muffin recipe without butter or oil. The texture is really soft. They are barely sweet, so the choc chips are a nice surprise in each bite. Totally going to make these again. I’m sure my toddler will enjoy them tomorrow morning. Thanks for the recipe!! Made these tonight and doubled the recipe. They came out delicious. They were moist and just enough sweetness. I was so excited to make these but and thought I could make it a little healthier by substituting half whole wheat flour instead. I have done this before without any problems but this time the muffins came out gummy and dense. I haven’t baked the entire batch yet and I’m wondering if there is a fix for this? It’s possible with the whole wheat flour, there is too much levening. Perhaps cut back on the baking powder to 1 teaspoon. The recipe turned out great! I used almond flour instead of regular flour and added an egg. I’m so glad you like it April! Thank you for sharing. Hi Amy, I just tried this recipe of yours. The taste is great, however the texture is not quite muffinish – it’s dense and not fluffy. I used spelt flour and noticed the dough was a little too gooey. Should I cut down the baking powder or add more bananas or avocado to make the dough less gooey? Thanks. Hi Curtney, the dough is a little different from typical muffin dough because of the texture of the avocado. Spelt flour may not complement the creamy ingredients as well– if the muffin seemed too dense for you, I’d try it with all-purpose flour next time instead. I hope this helps!